The Mitten Wife: Christmas is Coming! It took three years and a lot of convincing, but guess what? We finally have a REAL tree standing in our home! (well, at least I hope it's still standing!). When we lived in Virginia, we had a fake tree because we would travel for two weeks over the holidays, making it nearly impossible to keep a poor tree alive. Last year, I succumbed to using our fake tree again, since Kyle didn't have any time off on the weekends for us to cut one down together. Well, times are a changing! On our fourth Christmas as husband and wife, this wife finally got her wish! We ventured out on Sunday afternoon to find the perfect tree. There is a great tree farm right around the corner from our home, so within one minute we were at the farm waiting for a wagon and handsaw. A huge smile plastered clear across my face. 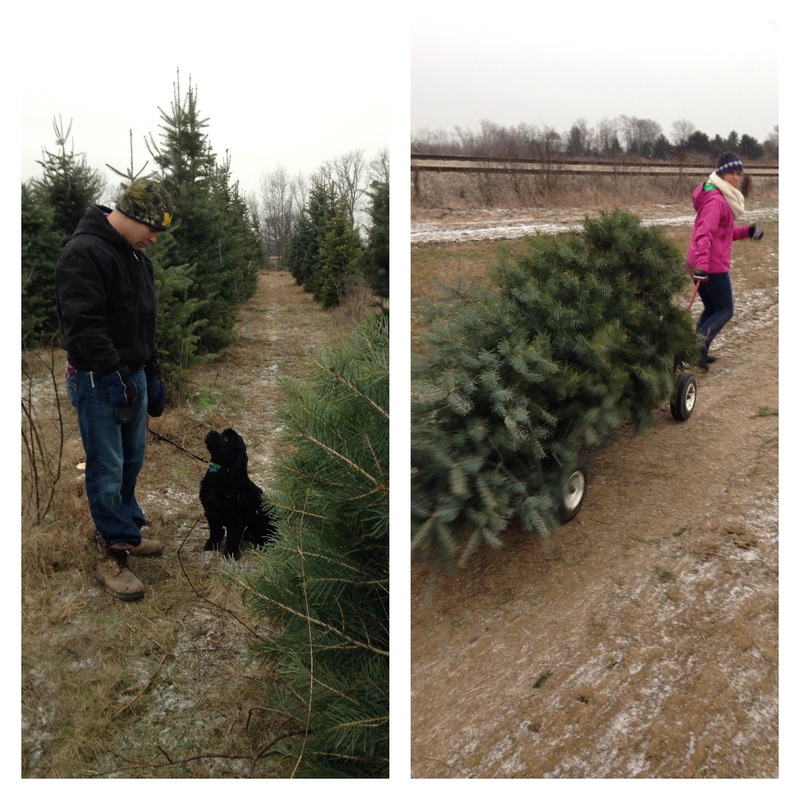 Maizy took the lead to look for our families tree. 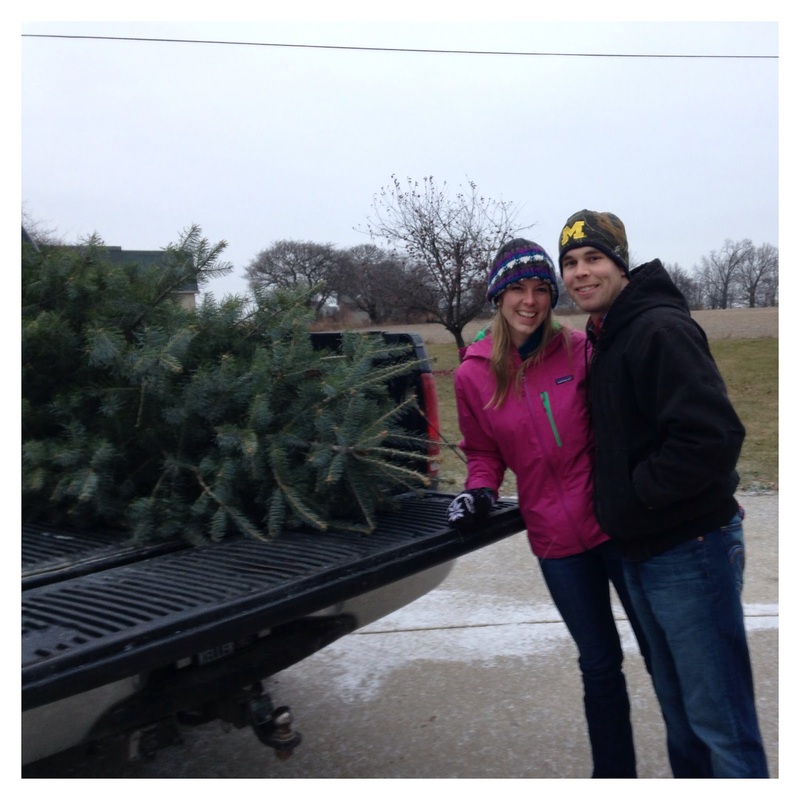 We realized we are way more picky than necessary when it came to picking a tree. I wanted a spruce because I grew up with them, and love the smell! Kyle just wanted some dimension. I have this problem with perception that my contacts have not been able to completely fix. I get nervous passing semi trucks on the highway because they appear much closer to my right side than they actually are. 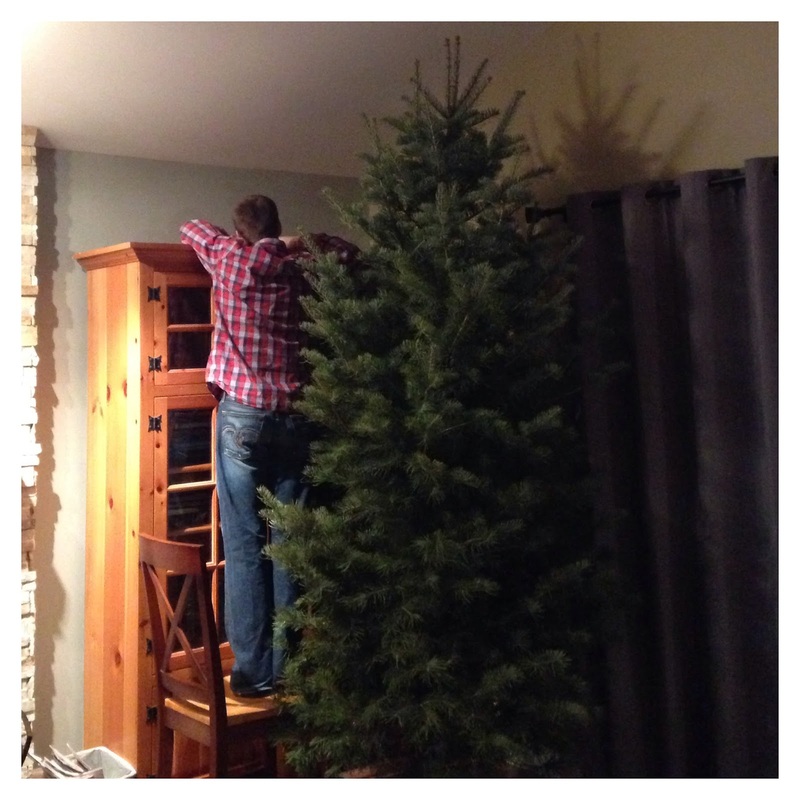 We picked this tree and I was POSITIVE it was going to be short, since our living room has cathedral ceilings. Not only is it scratching the ceiling (the ceiling is slanted to a peak, so we just need to move the tree a little into the living room and it wouldn't be kissing the ceiling anymore), but this thing is huge compared to what it looked like at the farm. Kyle's perception isn't off, so he was quite positive it would be a big tree for the space. It was also a wee too large for the tree stand we purchased. But, we were both too tired and lazy to go return it and buy another one. Nothing that fishing line and a nail can't fix. Oh, and (almost) most importantly, the kind! 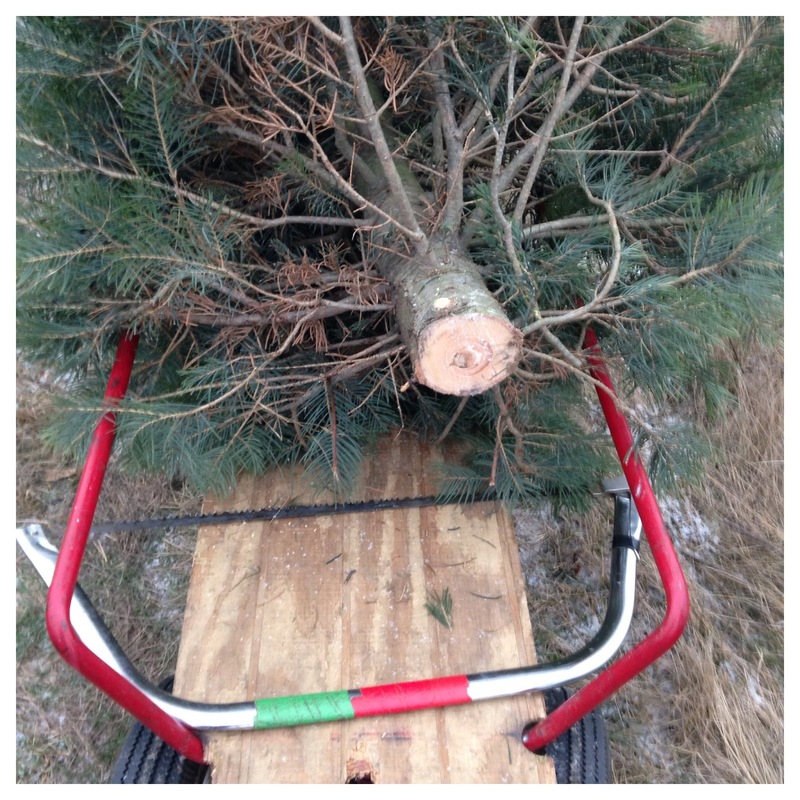 We just liked the tree, cut it down and never thought about the kind until we checked out. We were too excited that we had finally found one! The owner told us it was a Concolor Spruce...aka my new favorite tree of all time. It's so, so soft and smells like oranges. Seriously, my hands have smelled like oranges since Sunday. I kind of love it. The only downside is it's so soft that it is difficult to hang any heavy ornaments on the outside limbs. It's wonderful. It's marvelous. It's ours. Can you tell I'm just leaping with joy for our first real tree? Does your family do real or fake trees?! Although the sweeping up of the tree has been a tad annoying, I *think* I've sold Kyle on going real from here on out - that is, if it stays standing until the New Year. Ah! I think it would be fun to go au naturel at some point, but my family puts up a fake tree each year. Who decorates and in what kind of mood changes from year to year (except I'm pretty much pumped each December). This was the first time my brothers helped and didn't have a melt down--that I can remember. I blogged about it here (http://wp.me/p3MQd1-mK) if you have the time to check it out! What a beautiful tree and how much fun! We have a real Xmas Tree each year - since 2008! The first 5 years of our marriage we didn't have any trees - I always grew up with a Douglas Fir and that's what I have now. I love Tree too. And although I can't go back to childhood, I recreate some of the magic of it with Tree each year. Enjoy your tradition! Medical Mondays: Medicine + Holidays!